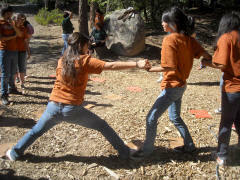 Youth Ministries: So Why Go to Camp? Because it’s fun, you make friends, and you learn a lot of really cool stuff. Making new friends. Fishing in a mountain stream. Playing flag football, soccer, softball and water sports. Going canoeing or hiking. Climbing walls or towers or going through a challenge course. Serving meals to the homeless. Participating in drama or playing paintball. Worshipping around a campfire or spending time with teens in another country. Teaching and playing games with kids in Ohio or the Bahamas or Mexico. Improving your photography or learning arts and crafts. 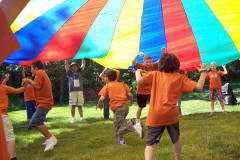 Each camp is run a bit differently, but every day at camp is filled with activity. You might start off with a sport, and then learn archery or run a challenge course. Your dorm may want to work on a drama that will be performed during chapel or worship. Lunch might be followed by a paintball game or doing a bit of work around camp. 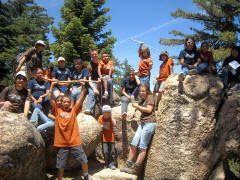 The evening meal is often followed by gathering around a campfire or playing games together. If you are attending a mission camp, each day will be spent teaching and playing games with children or feeding the homeless or teaching VBS to a group. Regardless of the camp you choose, a focus during camp is building new friendships and discovering more about the friendship you have with Jesus. Is it like a Bible camp? We are not a Bible camp, though we do use the Bible to teach about God’s love for us. The goal at a GenMin camp or mission is not to teach you the Bible, but to teach you about your friendship with Jesus. For example, this year’s theme scripture is Romans 5:11: “So now we can rejoice in our wonderful new relationship with God because our Lord Jesus Christ has made us friends of God” (The Message Bible). We will focus on this friendship with God throughout the week during the activities and worship. Short for Generations Ministries, GenMin is an arm of Grace Communion International focused on families, leadership training, camps and missions. We help congregations identify and train young leaders. We work with churches to develop family ministries that bring generations and cultures together, and we sponsor camps and missions to give young people the opportunity to develop relationships with peers, staff and with God. What do you mean by a mission camp? 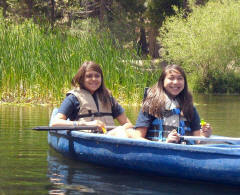 Mission camps are hands-on experiences to introduce campers to working with others. Crossing Borders is our longest-running mission camp. The team of missionaries is housed in Laredo, Texas, and makes day trips across the Mexican border into Nuevo Laredo. The activities might include feeding large numbers of people, helping with adult and children’s teaching services, praying with people, visiting orphanages and playing with the children, a construction project and conducting a vacation Bible school for children of “pallet city,” a poverty-stricken shantytown with no electricity or water that consists of hundreds of small shelters made of salvaged materials. California, Colorado, Connecticut, Florida, Georgia, Illinois, Louisiana, Minnesota, North Carolina, Ohio, Oklahoma, Tennessee, Texas, and Washington State. Cost depends on where you go and how long the camp runs. The costs include all meals and activities and often a T-shirt or two. Transportation costs to and from camp are not included. Go to https://resources.gci.org/genmin for more information about each camp, including registration forms, costs and contact information.